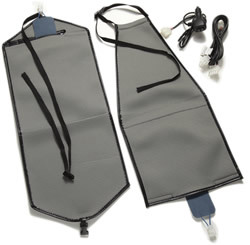 This kit works installed directly onto vehicle seats, or can be used with seat covers like Covercraft SeatSaver™ or SeatGloves® and most breathable aftermarket seat covers. A PAIR of seat heater elements (for two seats), for both the seat base and seatback. Special "envelopes" for all heating pads (4). Wiring harness that PLUGS INTO THE VEHICLE accessory POWER outlet. 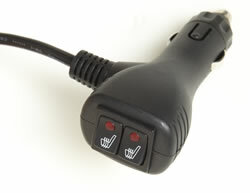 A power plug with INDIVIDUAL on/off heater controls. Now heated seat elements can be easily installed on any seats with formed or adjustable headrest, as well as beneath most fitted aftermarket seat covers made with breathable fabrics. "Plug & Play" easy installation, powered by the vehicle accessory power outlet. 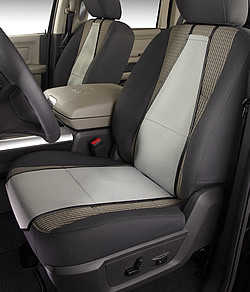 With SeatSavers, they can be installed on both the front or rear seats (vehicle accessory power outlet required). Self-Regulating & Faster-To-Ideal Temperature. PTC heating elements, Made in USA by Check Corp., radiate heat evenly and self-regulate for comfort. Enhanced User Comfort & Safety - Patented technology in the PTC heating elements ensures uniform warmth with no potential for overheating. The delivery of a constant, comfortable heat level offers added safety and protection against over-temperature conditions commonly found in comparable wire heaters. 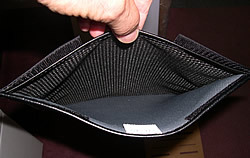 Covercraft designed unique "envelopes" to securely hold the heating elements, with grip material on the base and a layer of spacer-knit fabric on the top, to allow even heat transfer. Our use of "envelopes" allows SeatSavers and SeatGloves to remain machine washable when soiled. Insert the heating elements into each of the SeatHeater envelopes. The envelope with the strap and side release buckle is for each seat base. Place SeatHeaters onto the seats, carefully push the "tails" with wire connections between the seatback and seat base. Install seat covers over the SeatHeaters. Attach wire harness and plug into the vehicle accessory power outlet.